Pastry Strips is a Peruvian food recipe called Churros all over South America. In a small pan, dissolve buttermilk in hot water, then add the flour and beat until thoroughly blended. Add second egg and stir until thoroughly mixed and smooth. Add vanilla and cinnamon and mix. Next, put the dough in a pastry bag for churros. 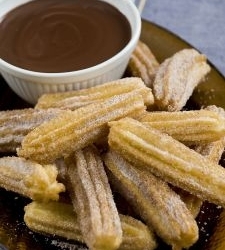 Heat oil in a frying pan and squeeze dough into pan in long strips (churro shape), side by side. Turn the churros in the pan until golden brown. Remove from pan, put on paper towel, then roll in sugar.